Hyponatremia is the commonest electrolyte disturbance encountered in the neurological and neurosurgical intensive care units. It can present with signs and symptoms mimicking a neurological disease and can worsen the existing neurological deficits. Hyponatremia in neurological disorders is usually of the hypo-osmolar type caused either due to the Syndrome of Inappropriate Secretion of Anti Diuretic Hormone (SIADH) or Cerebral Salt Wasting Syndrome (CSWS). It is important to distinguish between these two disorders, as the treatment of the two differ to a large extent. In SIADH, the fluid intake is restricted, whereas in CSWS the treatment involves fluid and salt replacement. Hyponatremia is a common electrolyte disorder encountered in patients in the neurological and neurosurgical ICU.,,,, The neurological disorders that cause hyponatremia are diverse and include neurotrauma, subarachnoid hemorrhage, intracerebral hemorrhage, meningitis and stroke. It can occur in the post-operative neurosurgical patient, especially those undergoing surgery in the pituitary/hypothalamic region.,, Hyponatremia occurring in disorders of the nervous system is either due to the Syndrome of Inappropriate Secretion of Anti Diuretic Hormone (SIADH) or Cerebral Salt Wasting Syndrome (CSWS).,,,,,,, It is important to distinguish between these two conditions as the treatment of the two differ. The treatment in SIADH involves fluid restriction, while in CSWS, fluid and salt replacement is the mainstay of treatment. 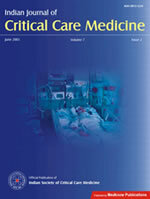 Hyponatremia in neurological disorders may be acute or become chronic. Sodium plays a vital role in maintaining the concentration and volume of the extracellular fluid (ECF). It is the main cation of the ECF and a major determinant of ECF osmolality. Sodium is important in maintaining irritability and conduction of nerve and muscle tissues and assists in the regulation of acid-base balance. The average daily sodium intake far exceeds the normal daily requirement. The kidneys are responsible for excreting the excess and are capable of conserving sodium during periods of extreme sodium restriction. The kidneys accomplish this primarily through regulation of water intake/excretion. If the serum sodium concentration falls, kidneys respond by excreting water. If the serum sodium increases (increased osmolality), thirst center is stimulated with subsequent ADH release by the posterior pituitary which acts on kidneys to conserve water. Aldosterone also plays a key role by regulating Na+/ECF volume. Its release causes the kidneys to conserve water and sodium which results in increased ECF volume. As changes in serum sodium levels typically reflect changes in body water balance, gains or losses of total body sodium are not necessarily reflected by the serum sodium level. The normal serum sodium level is 135-145 milli equivalents per litre (meq/l). Patients with a serum sodium concentration less than 135 meq/l are considered to be hyponatremic. The clinical manifestations of hyponatremia are more evident when the decrease in serum sodium concentration is large or when the decrease occurs over a short period of time. Patients in whom the serum sodium concentration is greater than 130 meq/l are usually asymptomatic, whereas those in whom these values are lower may have symptoms that include headache, nausea, vomiting, muscle cramps, lethargy, restlessness, disorientation, and depressed reflexes. Severe and rapidly evolving hyponatremia may present with seizures, coma, permanent brain damage, respiratory arrest, brainstem herniation, and death. Hyperosmolar hyponatremia: In hyperosmotic hyponatremia, solutes confined to the extracellular compartment induce shifts in transcellular water. Conditions causing hyperosmotic hyponatremia include hyperglycemia and the retention of hypertonic mannitol which results in hyponatremia because water shifts from the intracellular to the extracellular space, causing dehydration of cells. Iso-osmolar hyponatremia: Isosmotic hyponatremia occurs in patients who undergo transurethral resection of the prostate or hysterectomy. During these procedures, patients may absorb large quantities of hyposmotic glycine or sorbitol irrigating solutions leading to a dilutional reduction in the plasma sodium concentration. A less common condition of hyponatremia associated with normal serum osmolality is seen in patients with extreme hyperlipidemia and hyperproteinemia which is also known as pseudohyponatremia. 1. Volume-expanded hyponatremia occurs when the intake of salt and water exceeds renal and extrarenal losses. a. Disorders associated with interstitial fluid shift include congestive heart failure, nephrotic syndrome, cirrhosis, renal failure (acute and chronic), pregnancy and sepsis. b. Disorders associated with limited interstitial fluid shift are Syndrome of inappropriate ADH secretion (SIADH), hypothyroidism, adrenal insufficiency, primary polydipsia and cancers. 2. Volume-contracted hyponatremia is mainly caused by fluid loss from the intravascular space, which is induced by an intrinsic or a secondary renal loss of sodium, an extrarenal loss of sodium or hypokalemia. The causes include Cerebral Salt Wasting Syndrome (CSWS), hypokalemia, renal disorders producing sodium loss and extrarenal sodium loss like in vomiting and diarrhoea. 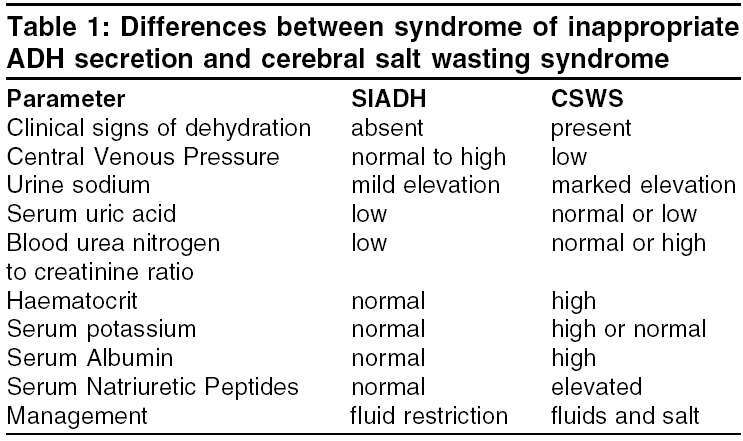 The hyponatremia encountered in neurological intensive care is most frequently of the hypo-osmolar type and the two common diagnoses are SIADH and CSWS.,,,,,,, It is important to distinguish between SIADH and CSWS because the treatment differs to a large extent between the two conditions. The SIADH is a volume-expanded condition, whereas CSWS is a volume-contracted state that involves renal loss of sodium. Treatment for patients with SIADH is fluid restriction and treatment for patients with CSWS is generally salt and water replacement. The clinical and laboratory differences between SIADH and CSWS are summarized in [Table - 1]. The mechanism by which intracranial disease leads to CSWS is not well understood. The postulated mechanisms include, disruption of neural input into the kidney or the central elaboration of a circulating natriuretic factor or both., Decreased sympathetic input to the kidney directly and indirectly alters salt and water management and may explain the natriuresis and diuresis seen within CSWS. A decrease in sympathetic tone leads to a decreased glomerular filtration rate, a decreased renin release, and a decreased renal tubular sodium resorption. In addition to a decreased neural input to the kidney, an ouabain-like compound in the brain may play a role in renal salt wasting. The natriuretic factors that play a role in CSWS include the Atrial Natriuretic Peptide (ANP) and Brain Natriuretic Peptide (BNP).,,, ANP is released from the heart in response to atrial stretch and induces vasodilation as well as natriuresis and diuresis. BNP is secreted by the cardiac ventricles in response to increased pressure or stretch and displays biological effects similar to those of ANP. Assessment of Volume status: This can be assessed by measurement of the Central Venous Pressure (CVP), Pulmonary Capillary Wedge Pressure (PCWP) or by radioisotope scanning. Routine blood investigations which include blood sugars, serum creatinine, blood urea, uric acid. To rule out hypothyroidism and adrenal insufficiency (especially in severe head injury and post operative patients undergoing hypothalamic/pituitary surgery). Once the distinction between SIADH and CSWS has been made, the management is summarized in [Figure - 1]. SIADH: If the SIADH occurs in an acute setting then the treatment involves fluid restriction to 1 litre per day., If anemia is the cause of SIADH then correct the anemia with blood transfusion. If the hyponatremia is severe then hypertonic saline (3% - 513 meq/l) should be used and concomitant Furosemide may be used to prevent fluid overload. If the SIADH is chronic then long term fluid restriction to 1.2-1.5 litres per day is advised. Drugs used for the treatment of chronic SIADH include demeclocycline, lithium, phenytoin and furosemide. CSWS: The treatment of CSWS involves hydration of the patient with normal saline (0.9% NaCl) and oral salt replacement.,,,, If the hyponatremia is very severe then 3% saline may be used. Fludrocortisone acetate in the doses of 0.2 mg via intravenous or oral route has been used for the treatment of CSWS. It acts on the renal tubules and increases sodium absorption. However, it can cause complications like pulmonary edema, hypertension and hypokalemia. Calculation of Sodium Deficit = 0.6 x (weight in kg) x (Desired sodium - Actual sodium). Use 0.5 for females. Desired sodium range = 125-130 meq/l. Rate of correction of hyponatremia: When hyponatremia is symptomatic and acute (<24 hours in duration), the serum sodium may be raised safely to 120-125 meq/l in 24 hours or less. 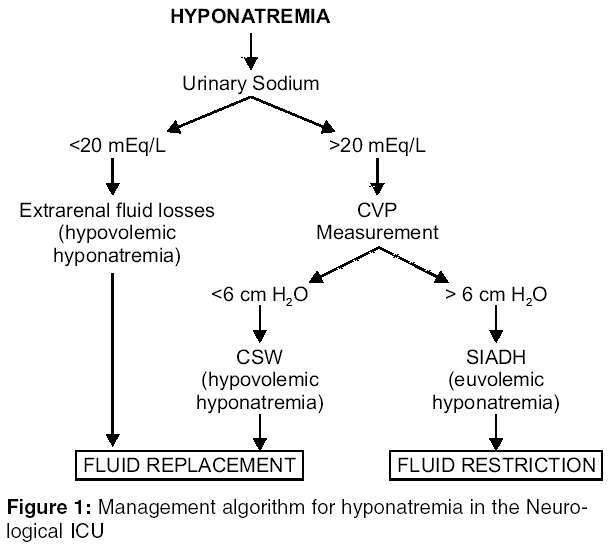 In patients with symptomatic chronic hyponatremia, or hyponatremia of unknown duration, the serum sodium should be raised slowly (0.5 meq/l/hr) to about 120-125 meq/l in order to avoid central nervous system complications (cerebral edema, pontine myelinolysis, seizures) and/or pulmonary edema. The total increase in these patients should not exceed 10-12 meq/l in 24 hours or <20-25 meq/l over 48 hours. Hyponatremia in the neurological intensive care unit is usually of the hypo-osmolar type and is attributable to either SIADH or CSWS. It is crucial to distinguish between these two disorders as the treatment is diametrically opposite. The treatment in SIADH involves fluid restriction while in CSWS fluid and salt replacement are essential.